Previously on To Jamaica and Beyond…. World War 2 had been running for 5 years, but was now in it’s final year. Ida Mae and Maurice were in New York with their families. Cecil was at Southfield, back from the USA and wondering what to do next. Mass Teddy and Mabel’s children wanted to emigrate to the United States. Mass Teddy had been previously listed as a pen-keeper, but his occupation was now listed as a labourer. He still owned Southfield Pen, so I am not quite sure why his title had changed. What is known though is that he was drinking heavily to excess and gambling away pieces of his land. 62-year old, Mabel Hodgson was running her late mother’s shop at Belle Vue. The second eldest son, John (Johnnie) was in Kingston. Linton & Hortense were yet to become American citizens. The youngest son Leslie had gone to Kingston to get his papers to proceed to America. A huge shock was about to happen! Mass Teddy’s wife, Mabel had been suffering with diabetes and high blood pressure for many years. She still however, continued to run her shop at Belle Vue crossroads. On the 28th March 1945, Mabel closed the shop and began walking the 3/4 mile trip home. While she was walking up the hill that leads to Southfield Pen, she collapsed. Mabel walked from her shop. Chaos ensued at Southfield. They carried Mabel into her home. Her sister Dorcas Speid, who had been with her minutes before, was summoned and quickly galloped across the fields and up the hill to the old house. Eight year old Cissy Hodgson – who was being raised by Mabel – stood outside the house concerned. Nothing could be done to save Mabel. She died in the house. Mabel was buried in the Hodgson Burial Ground on the Southfield Pen Estate. Cissy had lost both her father and loving grandmother within four years. Not only did Mabel’s death shock the family, it also shocked the whole Southfield community too. She was loved and held in great esteem by everyone. The rock and stability of the Hodgson family had gone. Leslie quickly hurried back to Southfield – without ever applying for his American papers. The end result was that Leslie stayed on in Jamaica, and never went to America. 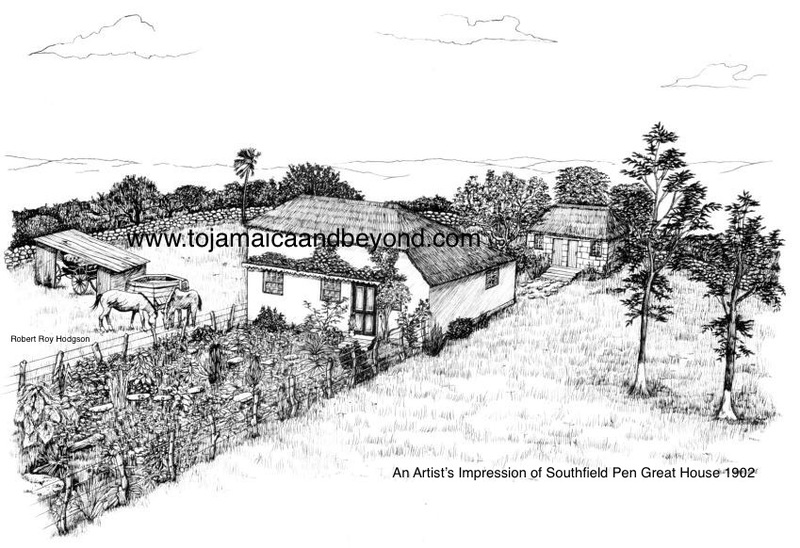 That decision would eventually see him take over the ownership of Southfield Pen Estate. “Even though her paternal grandmother had been born a slave in the 1800’s, Mabel Victoria Hodgson, née Bent, rose from obscurity with class and dignity to become a very successful and respected lady of Southfield. She done very well. Mabel had a half-sister, Julia Bent, who moved from Southfield to New York in 1916. In fact, Ida Mae moved in with Julia when she first went to America in 1923. The Bent’s are a very important part of the Hodgson story. My black African DNA heritage, is in part, attributed to Mabel’s ancestors, the Bent’s of Top Hill, Saint Elizabeth. More will be written about this heritage by the time we reach the Story Timeline period of the 1700’s. With the passing away of my great-grandmother Mabel, the stability of the Hodgson’s would be greatly affected. Robert Roy Hodgson. Apologies for not updating the website this week.